FAQs about decking you have always wanted to know! Do I need a permit to build my deck? In most instances if you are building a new deck on your home, you will be required to have a county permit if the new deck is more than 12″ above grade. If the deck is less than 12″ above grad you are not required to have a county permit because it is considered a patio and not a deck. Always check with your local permit and inspection office as these codes change from time to time. What do I need in order to get a permit for my project? Generally what you need is a copy of your property plat that clearly shows the house and its location in conjunction with the property lines. Indicate on the plat where the new deck is to be located on the property. You will also be required to fill out the application for a permit and there is a county fee involved. You will also need a drawing of the deck to scale (usually to ¼ of an inch equal to one foot) that clearly shows the dimensions of the deck, footer size and depth, beam size, joist size and spacing, decking material to be used, railing system and staircase location if any. Your county property tax account number is helpful in expediting the permit process. Make sure you stay within any set back requirements and building restriction lines which should be clearly marked on your property plat when you are designing your new deck. Do we need to call Miss Utility? Any time you dig, Miss Utility needs to be called. Remember: safety first. If we are installing the deck for you, we are required by law to call Miss Utility. For your convenience, we have enclosed the phone number for Miss Utility at 1-800-257-7777. Remember, Miss Utility only marks public utilities, gas, electric, phone and cable TV. If you have private lines such as electric run to your bug zapper or you have a well, septic tank or sprinkler system, these are not located by Miss Utility and it is up to the customer to advise us as to the approximate location of underground obstructions. We will do every thing possible not to damage private utilities. Unfortunately Mid Atlantic Deck and Fence cannot be responsible for damage done to private underground obstructions. Is my contractor supposed to be licensed? Yes, any contractor in the state of Maryland is required to have a Maryland State Home Improvement License (NOT A CONTRACTORS LICENSE) in order to install any fencing in Maryland. They should also carry general liability insurance and workers compensation so both you and your contractor are protected from any liability. Any licensed home improvement contractor should gladly provide you with a copy of their home improvement license and a certificate of general liability and workers compensation insurance upon your request. What type of framing material should I use for my new deck? ACQ is the new pressure treated southern yellow pine. ACQ stands for Alkaline Copper Quat which, in 2002, replaced the old CCA which stood for Chromated Copper Arsenate. It’s supposed to be better for the environment but it sure doesn’t sound like it. (I guess we will find out). Most framing used in today’s deck construction is usually #2 grade southern yellow pine. However, for a little more money, you can upgrade the framing to a #1 grade if you so desire. #1 grade lumber gives you a little better appearance and you may or may not see the value of the upgrade. We can honestly say 99% of our customers are okay with the #2 grade option. Should I take caution when using a grill, patio heater or any other heat source on my deck? Extreme caution should be used when you are using any heat source on your new deck or screen porch. When grilling or using a patio heater etc. you should allow ample distance from railings, houses or any other vertical or horizontal structures that might come in contact with the heating element some grills and patio heaters can reach temperatures in excess of 800 degrees and can cause severe damage to any structure. Always read the manufacturers instructions as to how far to place the heat source you are using to an existing structure. Never leave a heat source unattended and most importantly make sure that proper maintenance is always in place with any heat source you are using. Remember grease catches on fire very easily. Do I need to place a grill mat under my grill? Yes, grilling is one of the most common issues that cause staining on any decking or patio surface. Grease is a very hard stain to get rid of and in most cases will permanently stain any decking surface if not addressed immediately. The use of a grilling mat is recommended and can be obtained from any hardware store or purchased on line. If in the event you do drop that freshly cooked cheeseburger on your deck, make sure the grease spot is cleaned up immediately; usually any house hold degreaser can be used, just check with the manufacturer of your particular decking product regarding cleaning tips and tricks. What should I use for my bearing posts that support my deck? Typically you would want to use 6×6 pressure treated posts. Extreme caution should be used when you are using any heat source on your new deck or screen porch. When grilling or using a patio heater etc. you should allow ample distance from railings, houses or any other vertical or horizontal structures that might come in contact with the heating element some grills and patio heaters can reach temperatures in excess of 800 degrees and can cause sever damage to any structure. Always read the manufactures instructions as to how far to place the heat source you are using to an existing structure. Never leave a heat source unattended and most importantly make sure that proper maintenance is always in place with any heat source you are using. Remember grease catches on fire very easily. Should I use a back beam at my house when I build my new deck? This is a great question and we get asked it a lot. 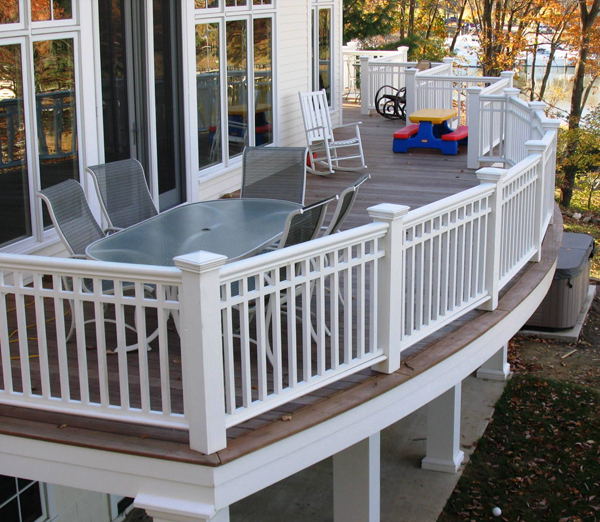 Some counties in the state of Maryland require a back beam on all decking projects. Prince Georges County is one of them. When we go out to design and estimate a new deck project, we always recommend a back beam if we are unclear as to how the original dwelling was framed and how the deck is going to be attached to the dwelling. What this means is most older homes (say, 10 years or older) have what they call a “solid ban board” on the house, whether it be a double 2×8 or 2×10, depending on how the house was framed originally. However, in today’s new housing market, most of the joists used in framing are either a web floor truss system or a TGI floor truss system which gives you no ability to attach the decking’s ledger board to the house properly, and in all cases you should have a back beam. Remember, you don’t want to be in the newspaper because your deck fell down or worse yet hurt or potentially kill yourself, friends or family. REMEMBER: SAFETY FIRST! What fasteners do you recommend to attach my decking boards to my joists? For pressure treated southern yellow pine decking, we recommend a 3″ ring shank nail approved for the new pressure treated ACQ pine. However, screws are better but take more time to install. 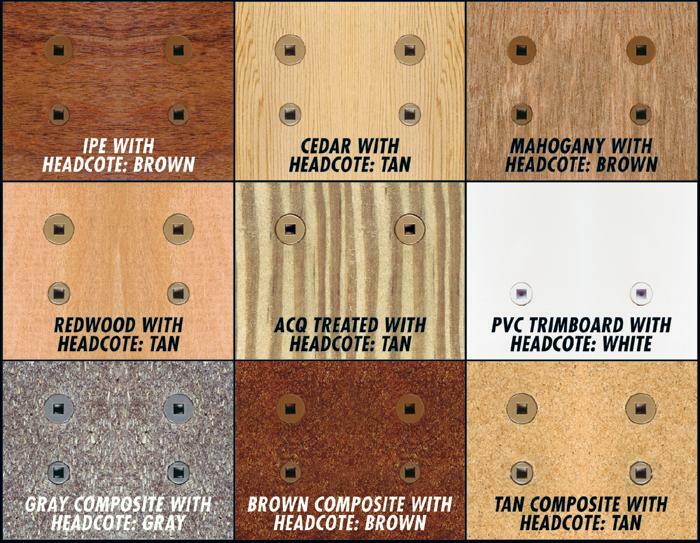 IPE decking looks really good if you use the EB-TY biscuits and wherever you have to use a screw, set the screw into the material and use an IPE plug to fill the screw hole. This method is a nice clean look for IPE decking. We recommend doing the same with mahogany decking. On composite decking materials, most manufactures have their own attachment method which should be spelled out in their installation manual. Most are screw down, some are clip down such as correct deck which gives you the hidden fastener look. With vinyl or plastic decking, they to also have their own recommended fastening methods such as Veka decking. This can either be screwed down with color matched screws or by using deck master or fasten master deck clips. Plastic decking such as Four Seasons or Trimax decking have their own clip system (which have hidden fasteners) for attaching their decking products to the joists. Because of the new ACQ lumber what hardware should I use for my new deck? All hardware—which includes all nails, screws, joist hangers, lag bolts, carriage bolts, etc.—should be ACQ approved. What this means is all galvanized hardware needs to be triple galvanized coated with zinc or stainless steel which can get very expensive. Just read the manufacturer’s labels to make sure that the fasteners you are using meet the new ACQ requirements. It’s better to be safe than sorry. Will my new composite decking fade or stain? 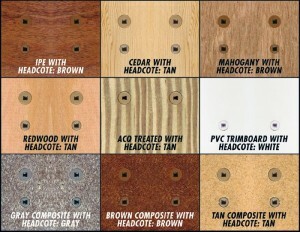 It is normal for composite decking materials to fade (generally 15 to 20% of its original color) over time. This is part of the normal weathering process of composite decking. Staining has always been an ongoing issue with composite decking, however most manufactures have care and cleaning tips posted on their websites. What does ACQ pressure treated pine mean? Why does southern yellow pine warp, crack, twist and split over time? Southern yellow pine is a sap wood and what causes the warping, cracking, twisting and bowing is the rate in which the moisture content in the lumber is being released from the lumber itself, and the wood fibers from within the lumber can’t keep up with the rate in which the moisture is being released. This is what causes the lumber to be dimensionally unstable. This is a natural occurrence and is a natural part of the lumber’s drying process. It does not mean you have defective material. It’s just the nature of the material we are dealing with. If you have a company or contractor that tells you that their southern yellow pine material will not warp, crack, twist or split, odds are they are not being straight with you. However a good wood sealer applied to the material will dramatically reduce the amount of dimensional instability of the product; it will not eliminate it all but it will help out tremendously. Don’t let this scare you; southern yellow pine is still one of most widely used wood fencing/decking products on the market today, but facts are facts and every consumer should be advised properly in order for the consumer to make an educated decision as to what material to use for their outdoor project. After being in business since 1986, we have seen the industry change from mostly wood decking products to alternative products such as composite and vinyl decking. Most consumers are searching for the ultimate low maintenance decking products. Well, let’s face it; there is absolutely nothing on the market that is totally maintenance free. There have been some manufacturers that have promoted their products as maintenance free and have gotten themselves in trouble by doing so. The location of the deck as to where it is located on the house, how much sun or shade it gets or how close to the ground it is will determine how much maintenance the deck will require. We recommend a good cleaning at least once a year. Twice a year wouldn’t hurt and just a general hosing off once a month is suggested. 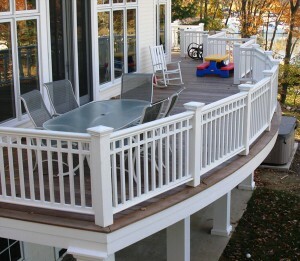 For more information on fencing or decking, please visit our website at www.midatlanticdeckandfence.com!